The ExpoImaging Ray Flash is a unique flash adapter that will convert your hot shoe flash unit into a ring light flash. 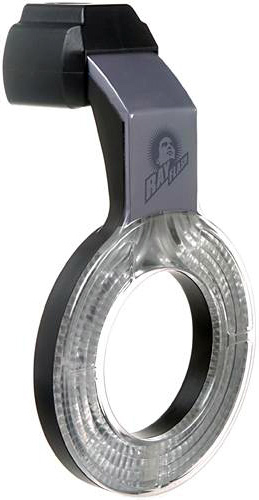 It simply slips over the front of the flash unit, and will fit any lens with a front diameter of no more than 4". It will replicate the lighting effect produced by traditional, expensive, and heavy powered studio ring flash units. The light distribution is accomplished through a sophisticated system of internal prisms, reflectors and light-shapers designed to distribute and project the light evenly around the lens. Because the Ray Flash relies on the hot-shoe flash to generate its light, it contains no electronics, no flash tubes and requires no cumbersome cables. And in addition, TTL operation works exactly the same as with the flash itself. The Ray Flash is ideally suited for fashion, wedding, portrait, journalist and macro photography as either a main or fill-in light.